Speaking of titles, I’m sure you’ve seen your share of ironic trailers & mash-ups, but this one’s pretty great. Stick around for the fountain gag. Now when you go to photos.google.com/search and find some results, you can expand the results cluster to show more images from that day—just as you can on iOS. (Hang tight, Android.) Just click the little downward-facing carat. 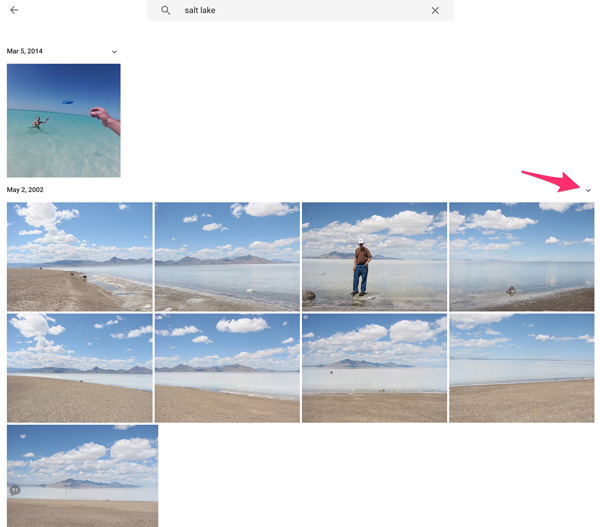 I found this really helpful the other day when I wanted to find some ancient (2002-era) images taken when my brother & I road-tripped past the Great Salt Lake. They were captured long before we had access to GPS, yet Photos recognized the landscape in a number of them & showed them when I searched for “salt lake.” I could then click the carat to see other images from that day. Russell Brown, get on this! I’m delighted to say that Lynda.com has just published my half-hour tour of Google Photos. It’s split into really small, focused chapters (e.g. explaining storage & backup options), so you can jump right to what matters most. Even if you’re not yet a member, you can see one chapter for free, and you can start a free trial to see the whole thing. The creation process gave me a new appreciation for just how good the Lynda staff is. Scott Erickson, Susan Varnum, and Zach Bobbit were enormously patient in the studio and did heroic editing to keep me from sounding like a tongue-tied doofus. Scott in particular offered great on-the-fly direction, channeling a new user’s perspective & challenging me to rethink, streamline, & clarify. Thanks, guys; you’re a real credit to the whole organization! Google Photos is of course rapidly developing, adding a bunch of new features in just the last few days, so it would be great to work more with the Lynda team as the product evolves. Feedback, questions, and requests are of course most welcome.